On Thursday I had the opportunity to go on a sporadic adventure to Ottawa, Ontario for the weekend. I decided to just say F*CK IT!!!!! and go. I packed my bags for the weekend, the gym, and work and I drove. Sometimes, the best memories in life are the ones you don’t plan for. We jammed to 90s hip hop, discussed philosophies of life (which everyone knows is my fave), sipped coffee and ended off with introducing him to Barefoot Moscato. Do you ever take risks? What does that look like for you? Perhaps it’s for a job and you want a promotion because you’ve been passed up previously. Perhaps it’s approaching a girl you’ve had your eye on, but haven’t had the balls to strike up a conversation. For me, it was saying yes. Like the previous grad post I wrote about here I took a deep breath and jumped. 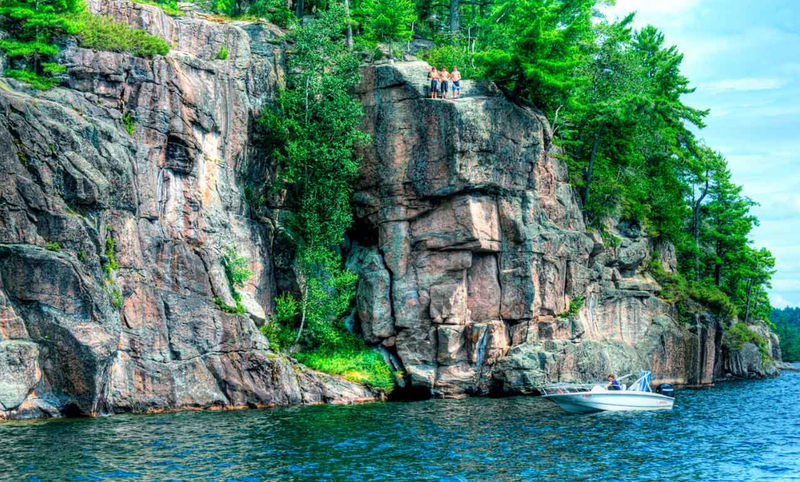 It reminded me of cliff jumping up north in cottage country every summer. One of my favourite jumps is 35 feet. You have to climb up the regular side of the hill, grab onto the tops of pine trees and then to a 10 foot alcove. In order to not fall directly onto the boat as it is parked below, this jump requires the participant to back up, sprint, and catapult themselves off the cliff so they don’t land on the boat. There is nothing like feeling those butterflies in your tummy as you climb those smooth but jagged edges of the rock face. Your heartbeat quickens as you walk the narrow path beside the pine trees. A small group of brave jumpers are set aside from the regular jumpers. When it is our turn, you just run and jump from the edge. There is no calculation to where the end is, or how many steps you need, or where the boat is. They belt out, “NEXT!! !” And then you run barefoot and leap. The feeling of free falling in the midst of huge rock faces, coniferous trees and endless lake in the horizon is breathtaking and unforgettable. Into the unknown, into the unfamiliar, but also into Freedom.